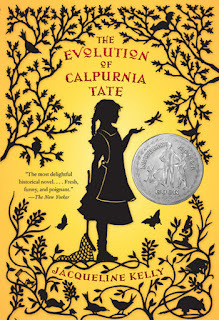 As a kid, most of what I learned about history came from reading historical fiction. Although non-fiction has come a long way since I was growing up, for me there is still something magical about learning a topic through a character that is experiencing it. But unlike historical fiction, a genre that gives a realistic depiction of history, science fiction refers to titles set in the future dealing with imaginative concepts - things that are often based on scientific fact or possibility, but not necessarily true. If I had relied on A Wrinkle in Time to learn about space, I probably wouldn’t have graduated high school. 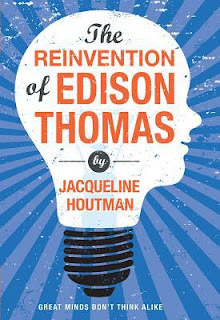 Fortunately, there is a subsection of fiction that has become increasingly popular in recent years, which Jacqueline Houtman has creatively labeled “sciency fiction”. She keeps a list of middle grade titles that fit into this category on her blog called Sciency Fiction. Houtman’s novel, The Reinvention of Edison Thomas, is a perfect example of “sciency fiction”. 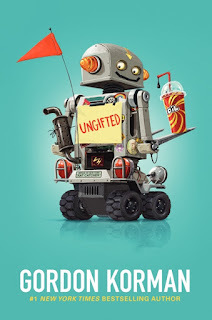 It weaves accurate information about physics and mechanics into the story of Eddy, a middle grader who invents a traffic calming device using parts from discarded machines, while redefining success and navigating social challenges. The Fourteenth Goldfish by Jennifer L. Holm also uses references to famous scientists – Galileo, Newton, Salk, Oppenheimer – in telling the story of 11-year-old Ellie as she mourns the loss of her best friend and her goldfish while exploring immortality and the ethics of scientific discovery related to her grandfather’s research. 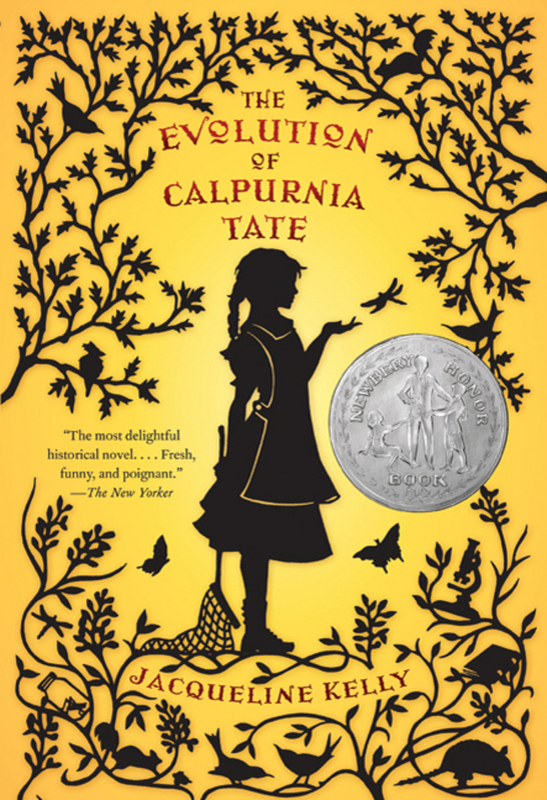 Combining my love of both historical fiction and “sciency fiction” is the 2010 Newbery Honor Winner, The Evolution of Calpurnia Tate, about 11-year-old Callie who is endlessly curious about the natural world. Each chapter begins with an epigraph from Charles Darwin’s Origin of the Species. The book has been followed up with a sequel and two graphic novels that continue to showcase Jacqueline Kelly’s ability to combine information with engaging story telling. On the Canadian front, Kenneth Oppel's Half Brother introduces readers to behavioural science through the fascinating relationship between 13-year-old Ben and Zan, a chimpanzee. Oppel’s latest title, Every Hidden Thing, explores archaeology with another engaging story aimed at young adult readers. Also for a slightly more mature audience, Susan Nielsen’s We Are All Made of Molecules joins the long list of current books featuring super smart protagonists who love to share scientific facts with readers. In this case, we meet 13-year-old Stewart who defines relationships geologically, has a cat named Schrödinger, and remembers his mother by breathing in her molecules. 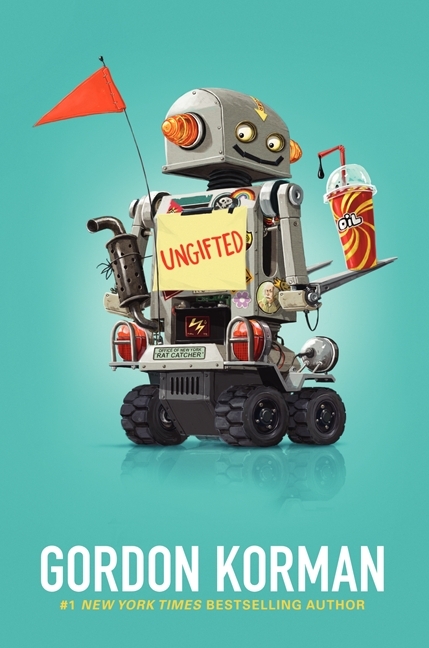 Gordon Korman’s Ungifted takes the opposite approach by throwing an “ordinary” student into a special program for gifted and talented students where a lot of learning happens for all the characters (and the reader). The Hypnotist and Masterminds series also weave scientific elements into action-packed stories that border on science fiction. Many other great titles combine science fiction and “sciency fiction”. The anthology Polaris: A Celebration of Polar Science employed science content reviewers to ensure the science fiction collection could be used to enrich and supplement science teaching. Fantasy can also deliver “sciency fiction” as it does in Paula Johnson’s Tower in the Crooked Wood, where Jenia uses her knowledge of trees to learn by trial and error about the magic used to kidnap her. 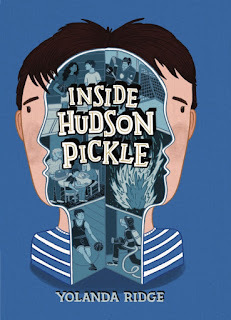 In celebrating the release of my recent Inside Hudson Pickle, I prepared a list of children’s fiction books depicting medical conditions caused by a single gene or chromosomal change for the Nerdy Book Club. Among the titles I researched, there was a wide variation in how much scientific detail was provided. 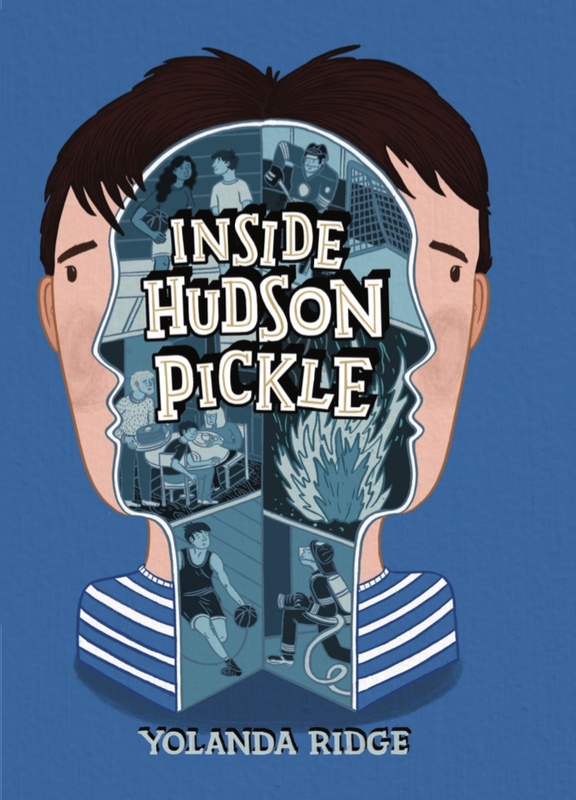 In my book, where 13-year-old Hudson’s uncle is diagnosed with a genetic condition called Alpha-1, I drew on my experience as a genetic counsellor to explain autosomal recessive inheritance within the context of the narrativke. Like many authors, I’ve tried to write the book I would’ve liked to read when I was that age – so I could learn about genetics without staring at one of Mendel’s pea diagrams. Today, there are many great choices for young people who want non-fiction, “sciency fiction” or a combination of both. This week's guest blogger, Yolanda Ridge, is a Vancouver-based writer with an interest in both fiction and science. 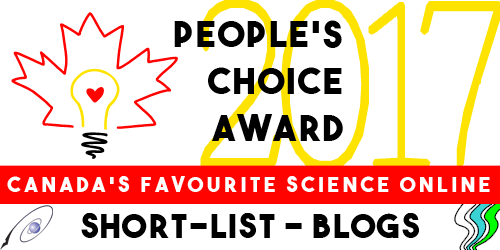 Retro Shows on Science from the CBC, and more! Summer is here, and a lot of people are out of school for months. Though it's time to be outdoors doing fun things like gardening and kayaking, nobody wants to turn their brains off for an entire summer. There's plenty of science to learn -- but where? Hosted at the University of Victoria's archives website is an amazing profile of a citizen scientist extraordinaire! Ian McTaggart Cowan was a true citizen scientist who was committed to sharing scientific knowledge with all Canadians. Click here for a link to the profile, with plenty of info on this man and the science he loved. He hosted three popular television series on the CBC: The Web of Life, The Living Sea, and Fur & Feather. All of his episodes are available at this link -- and there's enough episodes to watch one every day till September or binge a series over a weekend! This profile could be a good resource for home learning projects or for students who just want to keep their science brains revving. On CBC radio, the IDEAS program presents interesting ideas in just under an hour of thoughtful talk. Often these episodes are on science topics. On their website you can see links to recent broadcasts or scroll down to the link "Browse Past Episodes" and find links to many episodes which you can play right away or download onto your phone, computer, or MP3 player. Some of these talks will inspire teenagers to discuss the topics with their parents and teachers or find books at the public library! As well, IDEAS hosts the Massey Lectures every fall (five talks by a celebrated speaker), and the past lectures are available at this link. If you like listening to lectures and discussions and finding books on the same topics, you'll enjoy looking through the list of past lectures and picking out some to hear. In 2009, the Massey Lecturer was Wade Davis, speaking as a field anthropologist on "The Wayfinders: Why Ancient Wisdom Matters in the Modern World." The traditional knowledge he discusses include practical science studies such as navigation and sustainable agriculture. Canada's National Film Board has made most of their videos available online for free! (They have materials in French as well as English, y'know.) Check out their Subjects page on the Sciences at this link and pick out some videos both classic and recent for your summer viewing. There's also some teaching aids and material for younger children. Breaking the four minute mile. Many had believed that running a mile in under four minutes was beyond the capability of the human body. Once that psychological barrier had been broken, new records were set steadily. 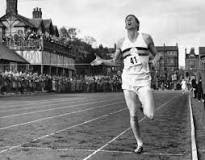 Bannister's record stood for less than seven weeks, before being broken by Australian John Landy. 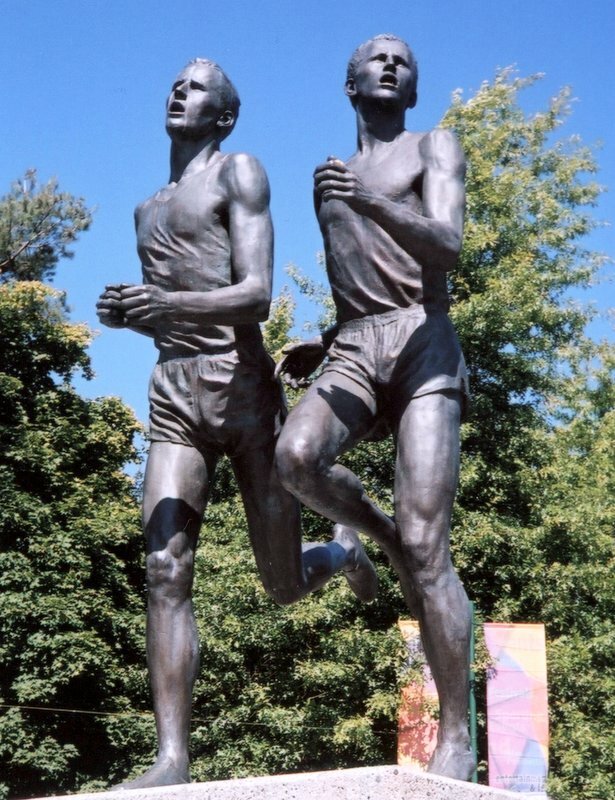 And six weeks later both men ran under four minutes in the Vancouver Commonwealth Games, in a race known as the "Miracle Mile". A far more difficult barrier will be broken soon when someone runs the marathon distance (26.2 miles) in under two hours. Bannister was an amateur athlete - a medical student at the time. He trained himself. He was helped in the race by a friend, Chris Brasher, who set the pace for the first two laps. The two-hour marathon attempt is a very different enterprise. Both Nike and Adidas have already spent years (and undisclosed amounts of money) on projects to reach this goal. A third project was launched two years ago by Yannis Pitsiladis, a professor of sports and exercise science at the University of Brighton in Britain. He has reportedly been trying to raise $30 million to enable a runner to break two hours by 2019. Running a marathon distance in two hours is an astonishing feat. It requires a pace of under 4 minutes 35 seconds per mile. 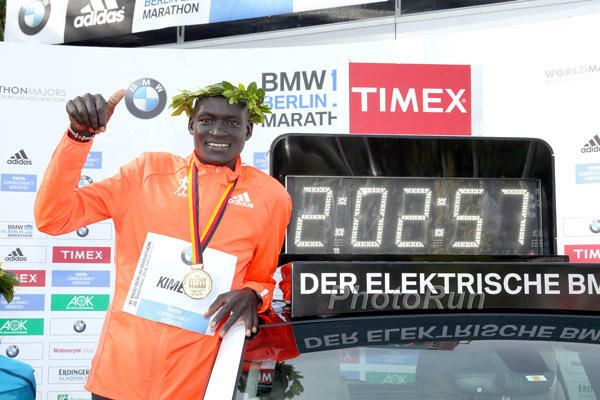 The current marathon world record, set by Kenyan Dennis Kimetto at the Berlin Marathon in September 2014, is 2:2:57 (2 hours 2 minutes 57 seconds). While 3 minutes doesn't sound like a long time over 2 hours, it is an improvement of 2.5%, which is quite significant. Last month, on May 6th, Nike staged a serious attempt to break the barrier. Nike has been working with three chosen athletes: Eliud Kipchoge of Kenya, Zersenay Tadese of Eritrea, and Lelisa Desisa of Ethiopia. The attempt was made at the Monza race car track, near Milan, Italy. The site was chosen for ideal marathon characteristics: flat terrain, calm winds, low temperature. The three star athletes were supported by a team of 30 elite marathon pacers, and a pace car. They were outfitted with Nike's best running shoes, the newly developed Vaporfly 4%. 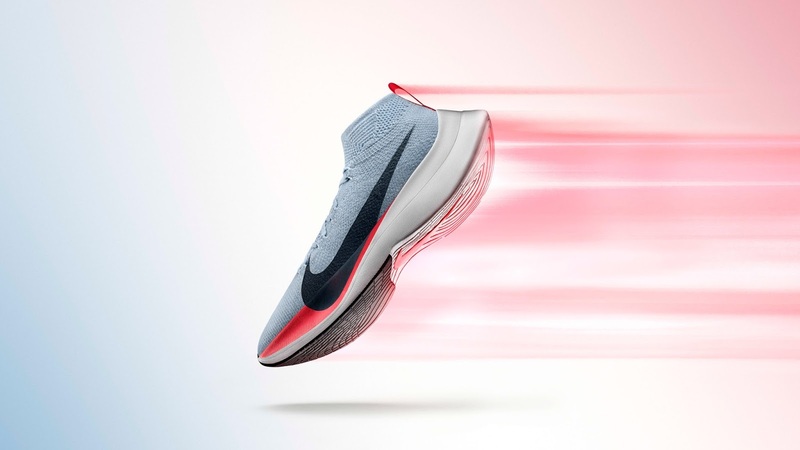 Nike has named its new shoes Vaporfly 4% because they claim that the shoes are 4% more efficient than its current best marathon shoes. What's different? The shoes use an extremely lightweight but resilient foam for the sole. And they have a carbon fibre plate inserted into the sole of the shoe. That plate functions a lot like the carbon fibre blade used by amputee "blade runners". The blade flexes with each step, converting kinetic energy into elastic energy, and then releasing it, returning the energy to the motion of the foot. There's ongoing debate about whether this type of technology confers an "unfair advantage" to its user. If it's deemed to do that, it will be illegal in official races. 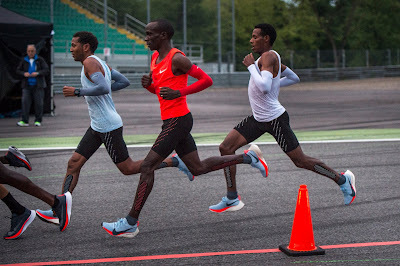 Although Nike will soon begin marketing generic versions of the shoe, the three athletes were equipped with customized shoes, designed to match exactly their individual gait. It is optimal to run at exactly the same pace throughout the distance. This attempt used a pace car, which travelled at exactly the required speed for a two hour marathon. It used a laser beam to project a line onto the track to show the pacing athletes exactly where they needed to be. Wind resistance is a factor in how much energy is needed to run. Studies have shown that at the required speed of 6 meters/second 4% of your energy is needed to overcome wind resistance. Another study found that 'drafting' eliminates almost all of that wind resistance. (Drafting is where a runner runs behind another runner, who thus shelters them from the wind). (The faster you're moving, the more important wind resistance becomes. It's extremely important for cyclists. At 40 km/hour over 90% of your energy is needed to overcome wind resistance! In my book Faster, Higher, Smarter you can read the story of cyclist Graeme Obree who was brilliant at finding different cycling positions to reduce drag). For this attempt, the runners were able to draft behind a V-shaped formation of 6 elite runners at all times. There were ten teams of three who took it in turns to shield the runners. 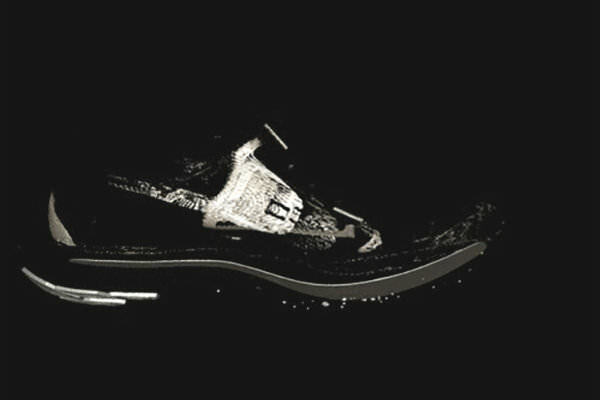 Nike used wind tunnel tests to determine the optimal configuration of the pacers. So Why No 2-hour Marathon time? It's a reasonable question. The project was looking for a 2.5% improvement over the existing world record time. Nike claims the shoes alone should have given a 4% improvement. The drafting should have given perhaps another 2% (not 4% because in a regular marathon each athlete will normally spend some time drafting behind competitors). Further advantages were available from the even pace; from drinks being delivered by moped instead of needing to be snatched from a table on the way; from the flat terrain. Is the science wrong? It's certainly possible, perhaps likely, that laboratory tests don't translate accurately to the road. Perhaps the Vaporfly should be Vaporfly 2%, not Vaporfly 4%. 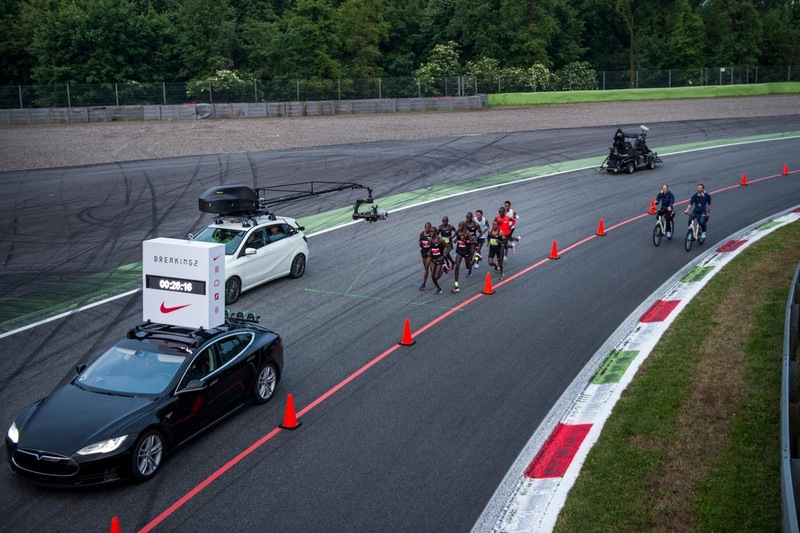 But it's also unrealistic to assume that one of the three runners will deliver a world-record performance for the Nike experiment. Obviously the world record is the most extreme performance ever. It's the outlier of thousands of top level marathon attempts. It's more realistic to re-frame the challenge as looking for an improvement from an average elite performance. Kipchoge's marathon times are the best of the three athletes. His average time has been 2 hours 5 minutes. So the challenge was to get a 4% improvement in his average performance. With that in mind, it's remarkable that Kipchoge was able to get an improvement of 3.5%. It seems certain that ongoing attempts using technology to assist runners will eventually result in the elusive two hour marathon. Kids Can Press has released the trailer for my new picture book biography about William Playfair, the Victorian-era rogue who single-handedly invented the field of infographics. Check it out! Normally, you wouldn’t expect the Beaufort Sea to be a hotbed of volcanic action. It’s covered with ice for much of the year. And during the short spell when the ice is gone, it’s a vast expanse of cold, featureless ocean that washes up on the northern coasts of Alaska, the Yukon, and the western Northwest Territories. But beneath that bland surface, the Beaufort holds a surprise – as many as 2000 mud volcanoes, says Steve Blasco, a respected geophysicist formerly with the Geological Survey of Canada. Before he retired, he was part of a research group studying the volcanoes. They are essentially like any other volcano, but with mud instead of lava, he says. Pressure forces the liquid mud up through the first available weak spot in the more solid layer above it. In the case of the Beaufort mud volcanoes, that solid layer is beneath the seafloor, several hundred metres below the ocean surface. And the solid layer isn't Earth's crust, but permafrost. 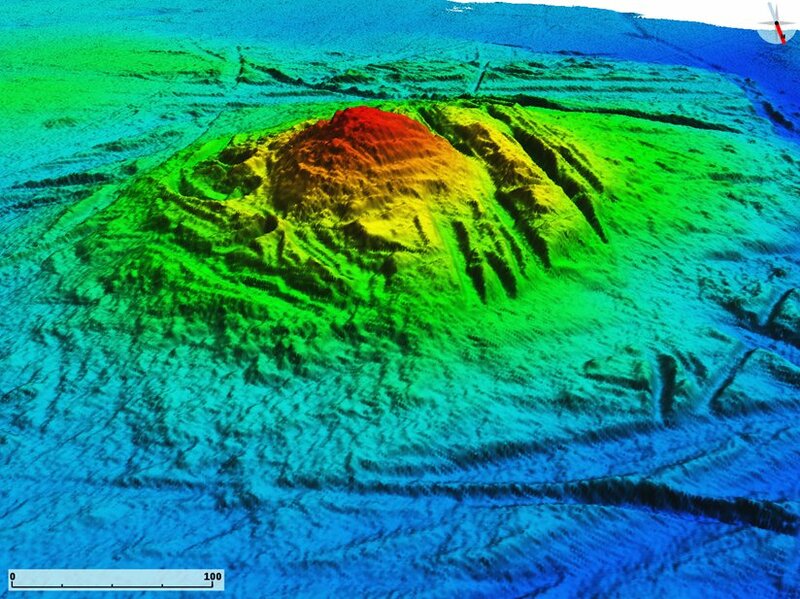 Just because they’re out of sight beneath the waves doesn’t mean mud volcanoes are small. 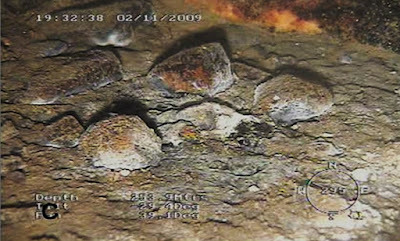 Some are more than a kilometre across and rise 10 storeys above the surrounding seafloor. Most have a shallow moat around them. Blasco says that with the right kind of instrumentation, it’s possible to track the volcanic chimneys, through which the mud flows, well down into the thick layer of sediment that covers much of the Beaufort seabed. is on the left, and the seafloor drops away into deep water on the right. Fluids – water and hydrocarbons mixed with fine sediments – pool beneath the permafrost that underlies the land and much of the sea around the margin of the Beaufort. The fluids spread through the sub-permafrost layers until they come to a weak point where the growing pressure pushes them up through the permafrost, piling up layer upon layer of thin mud into a spreading undersea mountain. The mud volcanoes aren’t distributed randomly over the seafloor. The weak spot that allows the mud to break through is often at the edge of the continental shelf, where the relatively shallow sea bottom drops away into the deep ocean, exposing and weakening the permafrost. About a third of the mud volcanoes mapped so far are along the shelf edge, Blasco says. Others are on the shelf itself or along the edges of the Mackenzie Trough, an undersea extension of the Mackenzie Valley. Most of the volcanoes are no longer active, but about 50 of them still appear to be venting mud, some quite actively. And on a few of those, the Blasco's Geological Survey research group found signs of life: mats of bacteria apparently living off the chemicals in the mud. Bacterial mats cover deep-sea mud vents in the Beaufort Sea. Another team of scientists discovered even more signs of life on the volcanoes. In December 2015, Charles Paull of the Monterey Bay Aquarium Research Institute, Scott Dallimore of the Geological Survey of Canada and other members of the team published a scientific article describing what they found in a close study of a few of the still-active mud volcanoes. Some of the sediment the scientists hauled up from the mud volcanoes contained skinny brown tube worms only a few centimetres long at most. The worms are closely related to tube worms found at a mud volcano in the Norwegian Arctic. In both cases, the worms and the bacteria appear to be part of a chemosynthetic community – that is, a community of animals living off the carbon spewed out, usually in the form of methane, from volcanic vents. Similar groups of animals have been found around undersea vents in many parts of the world, but this is the first time they’re been discovered in the harsh conditions of the western Arctic. And there may be more life down there. Video from a remotely operated underwater vehicle used in the same study showed that patches of the active undersea volcanoes are thick with bacteria and tube worms, and that shrimp and small fish seem to be especially plentiful at those sites. In fact, it appears that the Beaufort Sea’s mud volcanoes might be hotspots for both geology and biology. The original purpose of the survey that mapped the volcanoes was to assess geohazards in the Beaufort Sea in preparation for oil and gas exploration. Mountains of mud rising from the ocean floor constitute potential hazards, but Blasco says they’re easy to avoid. Now that it’s known where they’re likely to occur and what they look like to underwater remote sensing instruments, exploration companies survey them and stay clear. Of course, not everyone wants to stay clear. Oil and gas companies might want to avoid the mud volcanoes, but plenty of scientists would like to learn a lot more about them. An earlier version of this story appeared in the Yukon News, 13 January 2016. Fox-Skelly, Jasmin. "The strange worms that live on erupting mud volcanoes." BBC Earth, 6 November 2015. Paull, C. K., et al. (2015), Active mud volcanoes on the continental slope of the Canadian Beaufort Sea, Geochem. Geophys. Geosyst., 16, 3160–3181, doi:10.1002/2015GC005928.